Below the review you will find a radio show which was Aural Innovations Space Rock Radio show #341 (December 4, 2014). This show is dedicated to the music of Steve Palmer and features chats with Steve between tracks. I did a previous radio special dedicated to Steve’s music in 2008, which you can CLICK HERE to check out. Together I think the two make an excellent overview of Steve’s work from the past 20 years. You need an open mind and an adventurous spirit to be a Mooch fan. Steve Palmer has guided the Mooch mothership to dramatically different corners of the stylistic universe, from all instrumental space excursions, to heavier Space Rock, and on to 1960s inspired Psychedelic songs. In 2007 Ambientlive Recordings released the 2-CD set, Dr Silbury’s Liquid Brainstem Band. Frequently cited as a catalog favorite by Mooch fans, Dr Silbury was an epic collection of Space and Progressive Rock and was one of the first great Mooch collaborative efforts, bringing in numerous esteemed guests. 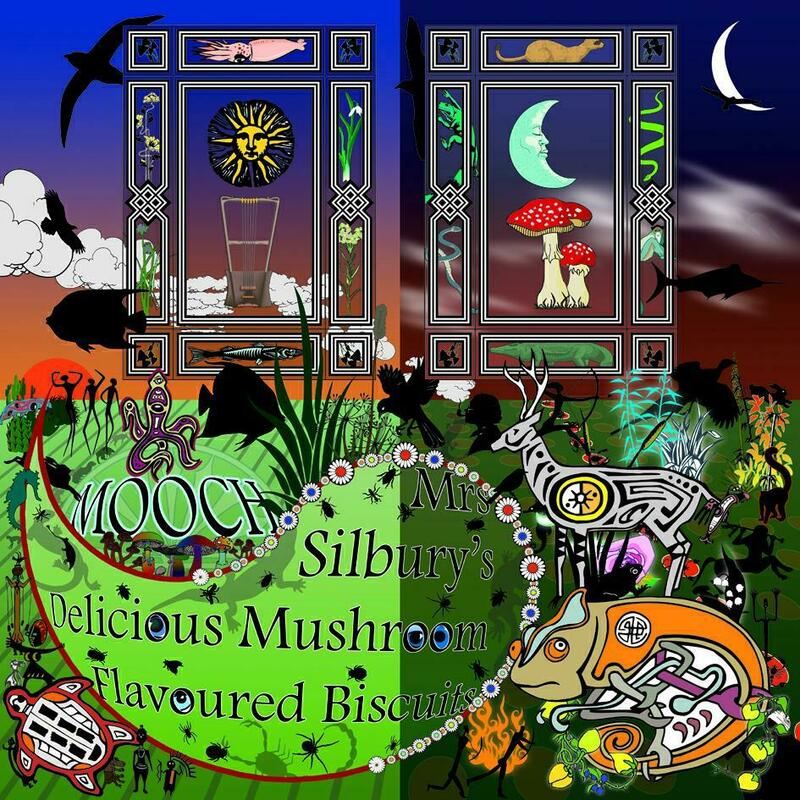 As 2014 comes to a close we have the latest Mooch album, and the follow up to Dr Silbury – Mrs Silbury’s Delicious Mushroom Flavoured Biscuits – released on vinyl LP by the Cosmic Eye label. T Minus None opens the set with an electro groove pulse that lays the rhythmic foundation for a variety of alien and melodic synths, plus a killer combination of spacey, Bluesy rocking and melodic jazzy guitar, all building up to a high intensity space rocker with delicious guitar from Gary “Moonboot” Masters. The Golden Rule is next and hits the ground running with a quick paced beat and a deep space Pink Floyd-ish atmospheric aura. I like the combination of drumming and frantic electronic pattern, and the music really hits its stride when Cyndee Lee Rule comes charging in with one of the most intense yet passionately rocking violin solos I’ve ever heard from her. Mellifluo is a lovely melodic piece that makes me feel like I’m at an extra-terrestrial Hawaiian luau. Clouded is a spaced out soundscapes excursion with tasty keys from Jez Creek. At over 12 minutes The Great Retsina Jam is the longest track of the set. I love the combination of classic Prog keys and majestic space synths. There are lots of fun embellishments as the music progresses, including a totally trippy Arabic flavored and slightly Bluesy stringed instrument, shooting star synths, cavernous drones, barren windswept planet effects and much more. This is symphonic Space-Prog at its very best. 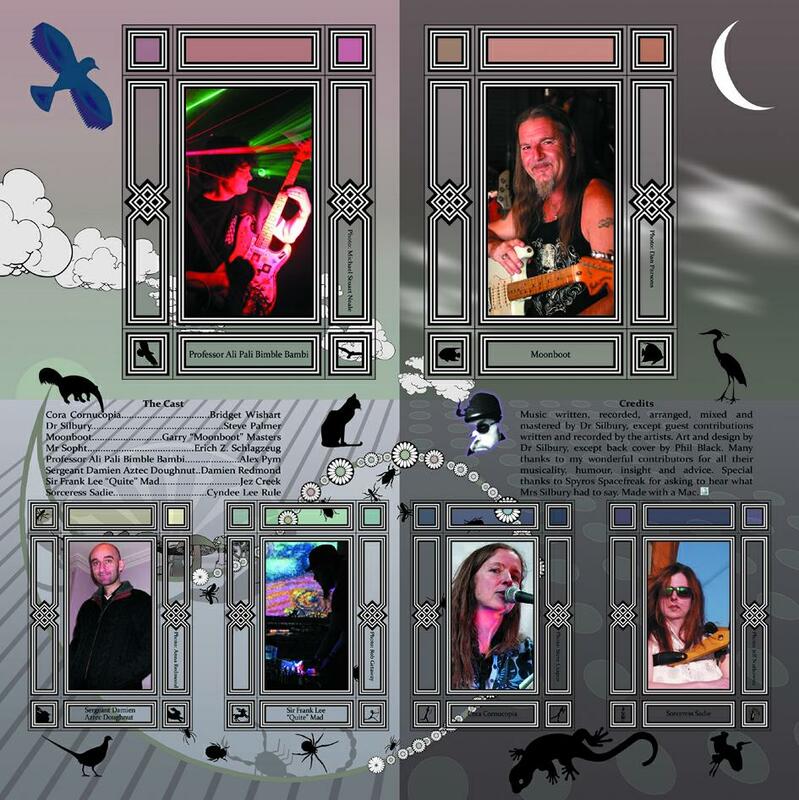 Pstrings is like a more groove rocking version of Steve’s Blue Lily Commission project and is led by another killer guitar solo, this time from Alex Pym. A steady rocking beat propels the music as Pym cranks out Bluesy licks while a banquet of alien synths swarm about. Finally, Another Time, Another Place is the sole song of the set, being a seductively melodic bit of Space-Pop with mind-massage vocals from Bridget Wishart. In summary, veteran Mooch fans are pretty much guaranteed to be delighted with this album, and it couldn’t be a better place for newcomers to start… Classic Mooch Space Rock with a solid cast of luminaries contributing.